Slide down a gigantic wave! A ladder on one side leads the climber up to the top where they then splash down! 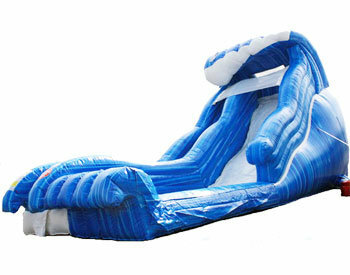 The Wild Wave jr. can be used wet or dry and is perfect for backyards. Be sure to click on the water fun section for water slide version. Playing in the sun has never been so much fun!This beautiful slide features Xtra Grip™ climb covers that reduce slips and help keep kids safe. Perfect for younger kids 10 and under!